According to IDC (International Data Corp) – between now and 2020…  there will be 44X the growth in information BUT… only 1.4X growth in IT professionals. For example, according to MBA Online there are 294 billion emails sent every day. To give you an idea of the impact it would take the US Postal Service two (2) years to process that many pieces of mail. Every day 172 million people visit Facebook, 2 million Blog posts are written (guilty as charged), enough posts to fill Time Magazine for 770 million years! So why are we waiting to manage and store all this information? According to an AIIM, the leading trade association in a Enterprise Content Management (ECM) survey, “the problem is we don’t think we have a problem!” The number one answer to the survey is “management is still dragging their feet;” followed by “people still want to hold onto their paper.” Finally, “people still think they need a wet signature (signature on paper)” …and so on. Yet AIIM also asked the following question, “How much more productive do you think your organization would be…with ECM?” The median answer is “at least 33% more productive.” So where is Enterprise Content Management (ECM) headed? We see the traditional ECM model moving from document centric to people centric, open and collaborative, community oriented and so on… A focus on the customer, rather than on products, is a critical ingredient for financial institutions to maintain and grow their business with their customers. ECM is an effective approach to helping financial institutions manage the information, the content necessary to achieve a customer-centric focus. As business and consumer customers become empowered by social media and pervasive communications, they are starting to realize they have choices for their financial services. These trends are reshaping the financial industry and are putting financial institutions into a more competitive atmosphere than before. Technology innovations today and into the future have been turned up-side-down! It used to be business drove innovation, today people do. So how do you manage the information tsunami so your customers don’t end up knowing more about your products and services than you do? That is the imperative for going paperless and more. We have moved from an era of the PC, to the internet and today the cloud. Each subsequent move has happened more rapidly. You can see how things were processed from the document, to the web page and today it’s an interaction. Consider the best known companies. Look how over time we have moved the cheese from IBM to Microsoft and now to Facebook. Content has moved from microfiche to image, to document, to content to social business systems? We see financial institutions moving from the PC to the web and mobile devices, but not nearly as quickly as their customers and the growth in the devices themselves. What’s next? Go paperless. What are 2 or 3 greatest misperceptions associated with implementing doc imaging? Centralized scanning (capture) is NOT the only way to control the document imaging capture and workflow. Scanners become increasingly powerful and inexpensive. Scanners for less than $1,000 include features such as duplex and color document capture. Software as a Service (SaaS) and in-house web-server based ECM applications offer click-once deployment, employ barcode recognition, forms recognition and e-signature technologies which allow for a more automated and accurate method of capture. Centralized capture out! Distributed capture in! Your ECM implementation happens overnight. False! Technologies such as report archive and a basic backfile scanning application, like signature cards may be in place in weeks, but careful planning and best practices while employing ECM applications for all new account and loan products, HR, accounting, Accounts Payable and so on take time and teamwork. You’re going to go “completely” paperless. False! There are going to be documents you have to keep, such as a mortgage and a deed. Your lawyer must decide. How long is a ‘typical’ timeline to get a doc imaging system up and running? If the ECM vendor provides “templates” for the applications the customer wishes to implement and best practices guidelines during the pre-implementation stage and during implementation a “typical” document imaging implementation timeline will be 30-90 days. If the customer is exceptionally well organized in terms of defining their applications and indexes it can be 30-45 days. The customer must provide good feedback and be fully engaged. Who is best suited to serve as the project owner for implementation: IT, the business line being imaged, or some other area? The IT department or IT consultant needs to be involved as well as the business line managers of the department or organization being implemented but the ECM project owner should be a person that has project management skills. They might not have all the answers but have the ability to get the answers and keep the project on track internally and be an advocate to promote the system throughout the organization. Besides loan origination, what are 3 other areas that should be considered for doc imaging? Are there any business lines or areas that are NOT good candidates for doc imaging? Why? There are areas that will be more challenging than others. If you are new to ECM, pick an area of the institution where there is a quick ROI like new account signature cards, new account documents, consumer loans, HR then make your way to more challenging are such as commercial mortgages. The primary concern will always be the same best practices and teamwork. What recommendations can be made to minimize staff keeping ‘ghost files’? If you cannot access the content, image files, documents and reports easily and quickly from anywhere across the organization, you will most likely have people keeping ghost files. This means stop the flow by capturing documents at their originating point within your organization and conquering the backfile as well. A scanning service is a good way to get that done. It is usually easy though for the bank themselves to go back and scan in all the old signature cards. This is a good way to be successful right off the bat. It has a good impact on the customer and the staff. I recently did a survey and analysis at a multi-billion financial institution and I expressly advised them they would never catch up with their backfile if they didn’t capture their documents at the source (branch) or in the field and utilize e-signature and auto-indexing methods whenever possible. Centralized capture is out! Distributed capture is in! Managing social business content lags far behind, but we are storing more content from more and more channels of communication. Can some docs be destroyed immediately after imaging? Any docs that can NOT be destroyed? This list is extensive and requires the advice from the financial institutions legal counsel. As a general rule, keep everything seven years. Keep the Mortgage, Release of Mortgage and Note permanently. 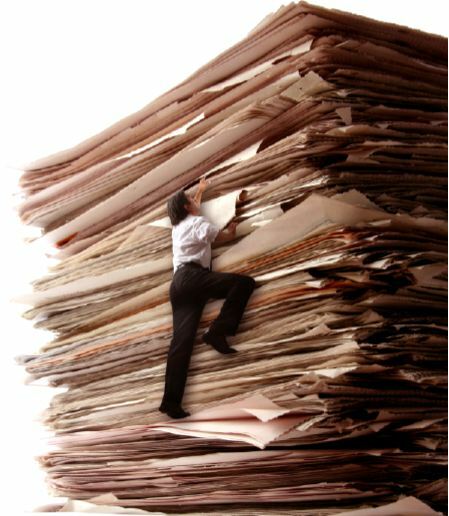 For more information or an ROI analysis of your needs to go paperless contact sales@identifi.net or visit our website www.identifi.net. ← Who isn’t afraid of failing? !